Marine Assists | Inland River Services | Brennan Marine Inc.
Help is there when you need it most! Brennan can provide carriers, terminals, and contractors with marine assists as needed. With a quick call to our dispatch center, open 24 hours per day – 365 days per year, we are ready to provide lock and bridge assists with AWO-RCP compliant vessels, dive teams, barge lightering, and salvage. Consider us as a resource regardless of where you may face challenges along the Upper Mississippi River. If you are near any of our ports of operation, especially near La Crosse, WI (UMR 697) or Lansing, IA (UMR 660), we can respond quickly and assist large vessels through Locks 7, 8, and 9 as well as any of the bridges that span the river in this area. 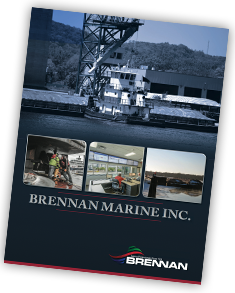 Brennan typically has assets located throughout the Upper Mississippi River so consider us when you need marine support. Brennan Marine, Inc. is a leading provider of high-quality, efficient inland waterway and barge transportation services. For more information on marine assist services, download our brochure.